Aigosthena (Greek: Αιγόσθενα), also Egosthena, was an ancient Greek fortified city of Attica 19 km (12 mi) NW of the ancient city of Megara to which it belonged. 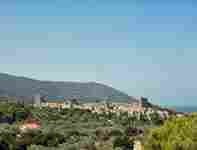 The fortified port was built in a forested, hilly area beside the coast of the Gulf of Corinth. The walls of the ancient city are preserved to significant height around the citadel and along the northern wall. The citadel retains several of the tallest surviving towers of ancient Greece. The site is located in the surrounding village of Porto Germeno (which is also known by the name Aigosthena) and overlooks the Gulf of Corinth as well as the Alkyonides Gulf.It is part of the municipality of Vilia and is historically the northernmost city of the Megaris (Megarida).There is a small bay located to the west named Aigosthena Bay. The site is 48 km (30 mi) NW of Athens. Aigosthena is linked by road to Vilia and the GR-3 (Athens - Thiva) and south to Schinos Beach and to Megara. The ancient site of Aigosthena consisted of a fortified citadel connected to the sea by two fortification walls. Measuring roughly 90 by 187m (~575 Doric feet), the citadel was roughly trapezoidal in plan, with the narrower side (113m) facing west toward the sea. The citadel was constructed along the contours of a 55m hill, and was defended by eight artillery towers incorporated into its perimeter wall. There was a primary gate on the west side into the area between the north and south walls to the sea. A small postern (auxiliary) gate was located immediately north of the second tower on the eastern side. The northern of the two walls to the sea is well-preserved, stretching 370m to a final tower of which the foundations and fallen blocks are now underwater. The northern wall consisted of six towers and a fortified gate running in a nearly strait line from the northwest corner of the citadel to the sea. The bed of a river runs along the probably line of the south wall, which is not evident. The walls were built in a variety of masonry styles, which may be evidence of different phases of construction. Masonry styles in use include isodomic (aslars with hammered faces and drafted corners), pseudo-isodomic, and - in sections – a style approaching polygonal. In general terms, these walls are among the best preserved of any of the Hellenistic period and show a high level of skill and finish. There is clear evidence of quarrying immediately south of the southeast tower of the citadel. Based on the design of the defense towers, Ober proposes that the site was fortified after 370 BCE. Lawrence opts for a date in the late 4th century BCE, on the assumption that Demetrios Poliorcetes built the fortress rather than simply occupying it. The site was under the control of the Achaean League in 243-224 BCE, and in 224 - 146 BCE it joined the Boeotian League. Shrines of Melampos and Heracles are known to have existed by inscriptions recovered on the site. The town and its warehouses operated down into Roman times. An inscription of c. 420 CE listed Aigosthena as a free city. A five-aisled Christian basilica was erected in the lower fortified area in the medieval period, and there was a monastery complex within the citadel. Lawrence, A. W. 1979. 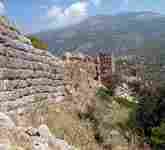 Greek Aims in Fortification. Oxford. Ober, J. 1987. Early Artillery Towers: Messinia, Boiotia, Attica, Megarid. AJA 91 569-604. Smith, Philip J. The archaeology and epigraphy of Hellenistic and Roman Megaris, Greece. Oxford: John and Erica Hedges Ltd, 2008.